"There are few places on Earth that are more awe-inspiring than Yosemite Valley nestled in the Sierra Nevada Mountains. Home of the undisputed King of the valley is "El Capitan", an exposed rock face of unmatched size that serves as silent sentinel presiding over the majesty of Yosemite's other natural wonders. As I painted I would often muse, "You see the face of God in nature...in the mountain vista. You hear Him in the rustle of the wind in the trees...taste, smell and feel Him in the fragrance of flowers and in the sweet air and water found in the cathedral of the wild." Indeed, there is no more profound visual exposition of this soul-searched sentiment than in the painting, Yosemite Meadow. In this oil, riders are dwarfed against the glory of the background as perspective to man's place in creation and in relation to their Creator. As I completed Yosemite Meadow, I counted each day as a blessing and took in the full glory of God's creation." Offer Good June 21 to July 7, 2013. Visit us today to see this breathtaking new piece in person. The edition size is small and expected to sell quickly, so reserve yours now. New From Artist Mark Keathley - "Road to Yesteryear"
When I roam the roads of Cade's Cove, I have this longing to go back in time to those simpler days. Several times I have fought the urge to cry over what has disappeared from our culture. The simple living and hard work and true "ownership" of property has been replaced with the American Dream - somehow now defined as being wealthy, having a dream home, not having to work much, throw in some fame and a fancy car and the latest cell phone, oh, and if I can get something for nothing, then I have arrived. Yes, this is a bit cynical, I admit, but up in these hills, I feel it the most. There, right in front of me is a community of folks who worked hard because they had to. A community where each one provided some important piece to the survival of them all. With no interference from the outside, they were free to pursue the most efficient way to improve their life and provide for the wellbeing of their families and the group as a whole. So walk with me a bit, down this dusty road, and lets visit the past where there were only two rules - Don't encroach and Do what you say. With these two rules, folks can live in peace, plan for the future, and build a dream where no one can take it away. This is where I want to go, down the Road to Yesteryear. Not to the old way of doing things, because I do like my technology, but to the old way of common sense and common good. Hanging art, especially a painting can be very intimidating with all that has to be considered to do it correctly: How high should the art be hung; what are the proper type of hangers needed to support the art; what tools will be needed; how do I hang a grouping of several paintings, etc. Well, we have recently discovered an excellent guide of step by step instructions for hanging a painting from the Xanadu Gallery in Phoenix, AZ, and wanted to pass it along to our readers. Hope you will find it helpful. 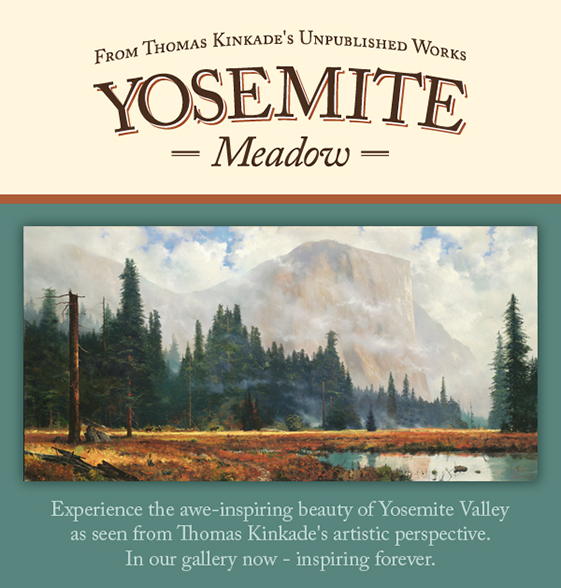 Please note as well that Insky's Thomas Kinkade Gallery offers no charge hanging service to our collectors. We also offer free delivery and in-home showings. We hope you will take advantage of these services.